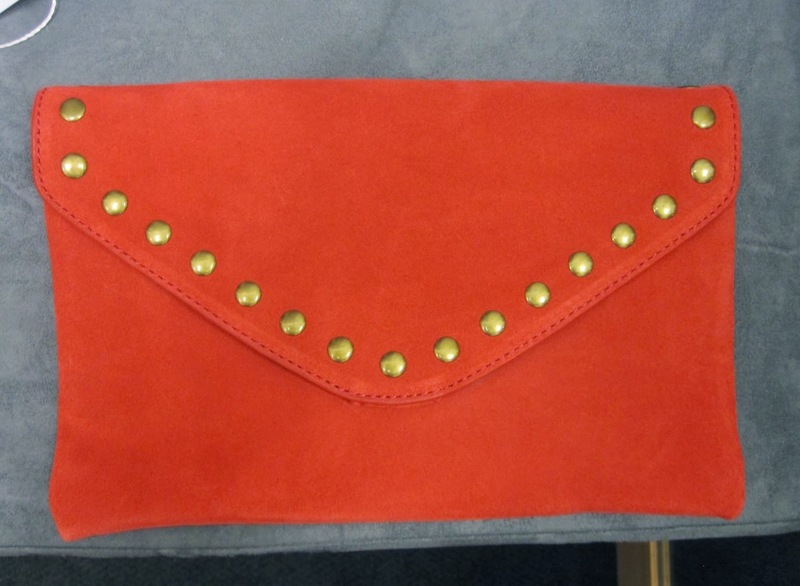 J Crew Factory’s studded suede and leather envelope clutch (05313, $98) comes in maraschino cherry (MCH). I would’ve liked smaller studs and a little closer together. The spacing on the studs made the look feel just a bit sparse and just a bit cheap. What boots are those, cute! Ema – That will look cute w/the tartan Charlie. Cute boots! Where did you get it? Stephanie & Anon – The boots are Nine West Lil Dipper. They run tts. I took my usual 7.5. They're very comfortable. I think I got them early this year, like Jan, Feb. I got them at Macy's online. Today, while I was at work, my cousin stole my iPad and tested to see if it can survive a 30 foot drop, just so she can be a youtube sensation. My apple ipad is now destroyed and she has 83 views. I know this is totally off topic but I had to share it with someone! Helpful info. Fortunate me I discovered your website by accident, and I am stunned why this twist of fate didn’t took place earlier! I bookmarked it. I simply want to tell you that I’m newbie to blogging and site-building and definitely loved your web blog. Very likely I’m planning to bookmark your website . You certainly have perfect articles. Regards for sharing your web site. I just want to tell you that I am very new to blogs and actually enjoyed you’re website. Likely I’m want to bookmark your blog . You surely come with outstanding stories. Thank you for sharing with us your website page. I just want to say I’m all new to weblog and certainly enjoyed this blog. Almost certainly I’m planning to bookmark your blog post . You certainly have fantastic articles. Regards for sharing your web page. I simply want to say I am just newbie to blogging and site-building and seriously loved you’re blog site. Almost certainly I’m want to bookmark your site . You actually have terrific article content. Appreciate it for sharing your blog site. I simply want to mention I am just beginner to blogging and definitely loved you’re blog. Probably I’m planning to bookmark your website . You amazingly have good articles. Regards for sharing with us your web site. I simply want to tell you that I am just beginner to blogging and site-building and seriously savored your web site. More than likely I’m likely to bookmark your blog post . You really have good articles. Regards for sharing your blog site. Thanks for some other informative site. The place else may just I am getting that type of information written in such an ideal manner? I have a challenge that I’m just now operating on, and I’ve been on the look out for such info. I just want to say I am just newbie to blogs and truly liked this blog site. Likely I’m likely to bookmark your blog post . You certainly come with exceptional stories. With thanks for revealing your website. I just want to tell you that I am newbie to blogging and site-building and certainly savored your website. Probably I’m going to bookmark your site . You really come with terrific well written articles. Cheers for sharing with us your webpage. In the grand pattern of things you get a B- for hard work. Exactly where you confused us was first on all the facts. As they say, details make or break the argument.. And it could not be much more true in this article. Having said that, permit me tell you just what did give good results. Your authoring can be really engaging and that is most likely the reason why I am making an effort in order to comment. I do not make it a regular habit of doing that. Secondly, despite the fact that I can easily see the leaps in reason you come up with, I am definitely not convinced of exactly how you seem to connect your details that produce the conclusion. For right now I will, no doubt subscribe to your issue but hope in the future you actually connect the facts better. I’ve learn some excellent stuff here. Certainly price bookmarking for revisiting. I surprise how a lot attempt you place to create such a excellent informative site. I simply want to tell you that I am just newbie to blogs and seriously savored your web site. Very likely I’m want to bookmark your site . You amazingly come with really good writings. Kudos for sharing with us your web page. I just want to tell you that I am new to blogging and actually loved your web site. Most likely I’m planning to bookmark your site . You certainly have exceptional stories. Thanks a bunch for sharing your website. Speaking comes by nature silence by understanding. I simply want to tell you that I’m very new to blogs and definitely savored this web page. Very likely I’m planning to bookmark your website . You really have incredible article content. Thanks for sharing your blog site. Thank you for sharing excellent informations. Your web-site is so cool. I am impressed by the details that you have on this site. It reveals how nicely you understand this subject. Bookmarked this web page, will come back for more articles. You, my friend, ROCK! I found simply the information I already searched all over the place and simply could not come across. What a perfect site. Wow, marvelous blog structure! How long have you been running a blog for? you make blogging glance easy. The entire look of your website is great, let alone the content material! What i do not realize is actually how you’re now not actually much more well-favored than you may be right now. You are very intelligent. You recognize therefore significantly when it comes to this topic, produced me personally consider it from numerous various angles. Its like women and men aren’t interested except it is something to accomplish with Girl gaga! Your own stuffs excellent. At all times take care of it up! After I initially commented I appear to have clicked the -Notify me when new comments are added- checkbox and from now on whenever a comment is added I recieve four emails with the exact same comment. Perhaps there is an easy method you are able to remove me from that service? Thanks! Thank you a lot for sharing this with all of us you really realize what you are speaking approximately! Bookmarked. Kindly additionally discuss with my site =). We will have a hyperlink trade agreement among us! Howdy! I just wish to offer you a huge thumbs up for your excellent info you’ve got here on this post. I am returning to your site for more soon. Nice post. I learn something new and challenging on blogs I stumbleupon everyday. It will always be helpful to read articles from other writers and use something from their sites. An outstanding share! I’ve just forwarded this onto a coworker who has been doing a little homework on this. And he in fact ordered me lunch because I stumbled upon it for him… lol. So let me reword this…. Thanks for the meal!! But yeah, thanx for spending the time to talk about this subject here on your website. I’m impressed, I must say. Rarely do I encounter a blog that’s both educative and engaging, and without a doubt, you’ve hit the nail on the head. The issue is an issue that not enough folks are speaking intelligently about. I am very happy that I stumbled across this during my search for something regarding this. I’m amazed, I have to admit. Seldom do I encounter a blog that’s both educative and engaging, and let me tell you, you’ve hit the nail on the head. The issue is something which too few men and women are speaking intelligently about. Now i’m very happy that I found this in my search for something concerning this. This page definitely has all of the information I needed about this subject and didn’t know who to ask. I’ve read several excellent stuff here. Certainly worth bookmarking for revisiting. I surprise how a lot attempt you put to make such a great informative website.